Twitter (TWTR) begins trading Thursday, November 7, and Yahoo Finance's Breakout brings you an hour of LIVE coverage of the most highly anticipated IPO of 2013. The show includes an hour of full market analysis from the Yahoo Finance team, beginning at 9:45 a.m. ET. How does Twitter stack up against other recent social media IPOs, most notably Facebook (FB)? And are we facing tech bubble 2.0? Bruno del Alma, CEO of Global X, joins to discuss. Who is Jack Dorsey – the "nobody" turned tech titan billionaire? "Hatching Twitter" author Nick Bilton will be in studio with all the details. And we'll have a live report from CNBC's Julia Boorstin, coming at you from Twitter's San Francisco headquarters. 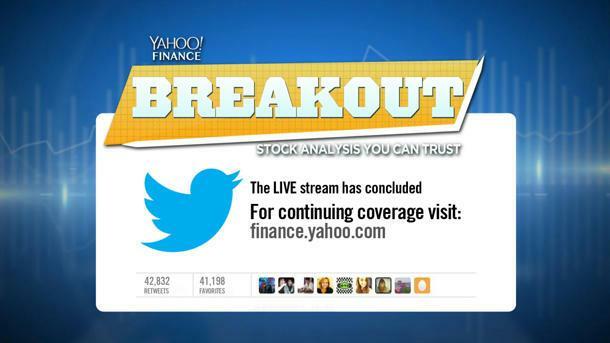 Our live stream is hosted by Breakout's Jeff Macke (@JeffMacke) and Matt Nesto (@Matt Nesto), with contributions from Yahoo Finance's editor-in-chief Aaron Task (@AaronTask) and senior columnist Michael Santoli (@MichaelSantoli). The Daily Ticker's Lauren Lyster (@LaurenLyster) will be monitoring the Twitter-sphere throughout the show for investor reaction on the social-media platform. We're also excited to welcome Yahoo News' editor-in-chief, Megan Liberman (@meganliberman), as well as Becky Worley (@bworley), host of Upgrade Your Life, to our bench of on-camera experts. Join the conversation and tweet us at @YahooFinance using the hashtag #TwiterIPO. It's official! Twitter shares have been priced at$26. That's 30% higher than the top end of the original range of $17-$20 (NB: Most media is ignoring that original pricing... conspiracy theorists would suggest Twitter and its bankers would prefer not to have attention drawn to the fact that the price was bumped up twice). For the sake of comparison, Facebook's initial price range was $28 to $35 prior to shares being sold at $38, with catastrophic results for newbie investors. As mentioned yesterday, Twitter still has the option of raising the number of shares offered by 15%. If the company sells 80 million shares at $26, Twitter's potential gross would be just under $2.1 billion. Perhaps not coincidentally, lead underwriter Goldman Sachs (GS) and the the other underwriters shared in the windfall created by bumping up Twitter's valuation. Based on the unusually low 3.25% fee being charged, banks will split $84.5 million — $25.4 million more than they were set to rake in at the original price. This was a strange deal in terms of pricing. While some of the standard hype was evident — "over-subscribed" and "only long-term buyers are getting shares" actually made me groan out loud — it seemed sort of chaotic at the end. Underwriters would have much preferred to have the final price be slightly higher than the last reported range. Twitter went right in the middle of the final "unofficial" rage of $26 - $28. It should be an interesting first day of trading. Be careful out there. IPOs make for good theater but lousy investing.